Features: This Rangers Filter Case fits all brands of lens filters from 49mm to 77mm diameter. Made of light, compact, and durable Nylon. Keeps your filters from unexpected impact while carrying around. 9 double-layer mesh slots provide organized storage spaces for your filters, lens caps, memory cards, USB cables and other small size camera accessories. Comes with a carabiner so you can easily secure to your backpack. Ideal for traveling, outdoor shooting, etc. Specifications: Material: Nylon Color: Black Storage: 6 Filters, 3 Camera Cards, 1 Lens Cleaning Pen. Dimension: 21.5 x 12 x 2.8cm / 8.5" x 4.7" x 1.1" Note:. Features: This filter is designed for diving fans who like taking photos and videos under water. Pictures taken underwater may suffer color distortion due to wave refraction. Suitable for GoPro Hero 5 camera with original waterproof housing, ultra-clear, do not affect the shooting high definition. The red one suitable for 5m-20m depth tropical and blue water, the purple one suitable for 5m-21m depth freshwater. (the depth less than 5m is unnecessary) Constructed using tough optically correct acrylic with high light transmission. Snap-on design, easy to install and remove. Note: the GoPro Hero 5 in pictures are not included, thank you. Specifications: Material: glass acrylic. UV FiltersA UV filter is used to reduce UV rays from entering the lens and striking the film. 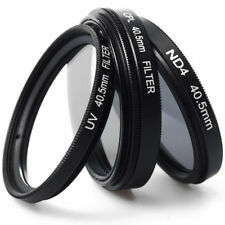 Modern lenses often have UV protection built into them as well as digital sensors, however, UV filters are commonly used to help protect the surface of the lens from scratches, smudges, dirt and other hazards.CPL FiltersA polarizer is different than most filters in that it is composed of two pieces of glass, mounted independently inside a round frame so that one can be rotated relative to the other. As it is rotated, it increasingly cuts out glare and haze. With an SLR, you can actually observe this change through the viewfinder. Polarizers reduce glare from water, glass, or any non-metallic surface. You can also use a polarizer filter to darken blue skies.ND4 (Neut. If you are looking for an easy-access yet highly protective lens filter pouch, why not give it a go?. 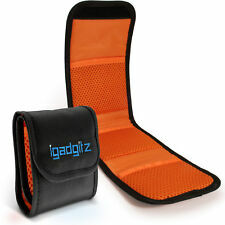 iGadgitz fold out lens pouch wallet custom designed to keep your lens filters safe, clean and tidy. Brand Unbranded MPN Does not apply EAN 4894663092191 Type Neutral Density To Fit Lens Front (mm) 58 Shape Round Mount Fitting Threaded Quality Perfect. Introduction: Neutral Density (ND) filters can reduce the intensity of light without appreciably changing its color. Classic ND filters have different f-stop reduction numbers and transmittance thus generated can be applied for different shooting conditions, such as portraiture, water falls, fountain etc.Our ND Fader is a compact all-in-one variable neutral density fader filter that adjusts the amount of light reduction with just the twist of your wrist. The index marks on the filter let you know exactly the amount of reduction at a glance. Giving you clear and precise shots at whichever density you are using. It is able to adjust neutral density freely from ND2 to ND400. You only need to carry one single filter with the same capability with ND2, ND4, ND8 ND. Digital Multi Coated: DMC filters greatly reduce lens flare and ghosting caused by reflections. A UV filter is mostly transparent to visible light, and can be left on the lens for nearly all shots. Serves as a permanent lens protector. 9pcs Ring Adapter 1 Filter Holder 1 Wide Angle Filter Holder 1 Lens Hood (Third Party). Sub-Type: Neutral Density Filter. Screw the adaptor ring onto your lens. Mount Lens Hood onto your filter-holder by pressing on the upper and lower parts of the lens hood. Protects impact or fall. UK Orders We're sorry if your item is not in perfect condition. Case for photo filters. NIKON 72mm A2 Lens Filter, with case. Condition is Used. Dispatched with Royal Mail 2nd Class Large Letter. Lens Hood Accessories. Lens Hoods. Filter Accessories. Closure Type:Velcro Fastener. Making it perfect for Cokin A and P Series Filters. The Phot-R filter pouch is designed to hold and protect 6 square or round filters up to 86mm wide and 100mm tall. Hoya 52mm CS. - Hoya Case. NIKON 62mm A2 Lens Filter, with case. Condition is Used. Hoya 55mm orange O (G) Lens Filter. With case. Hoya 55mm orange O (G) Lens Filter. With case. Condition is used. It will accept rectangle Cokin up to P-Series. This tough rip-proof padded woven nylon wallet fastens with velcro It folds to a convenient size. Belt loop on reverse. Filter Wallet case 6 pockets. It will accept round filter up to up to 77mm (Should take a 82mm but i don't have any to try).